Ideal for a necklace, lapel pin, tie tack, or a charm bracelet. Morgan lovers needed! 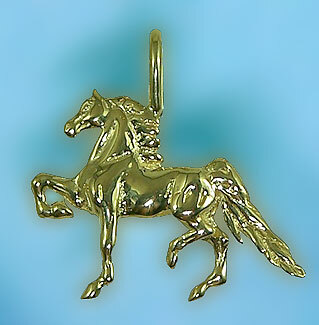 Great pendant for the morgan horse owner. Look at the action in this gaiting morgan horse design. This horse offers three dimensional design capturing the horse in action just like in the show ring. A delight for the Morgan horse lover. Dimensions:1 1/8 inches wide x 3/4 inches tall.